Did APPLES’ chart (AAPL) foretell the drop in share price ? Does it still ? Technical Chart Analysts would probably say yes. The chart below shows a two year long Inverted Cup and Handle pattern, with the handle represented by the upward diagonal channel on the right side of the chart. 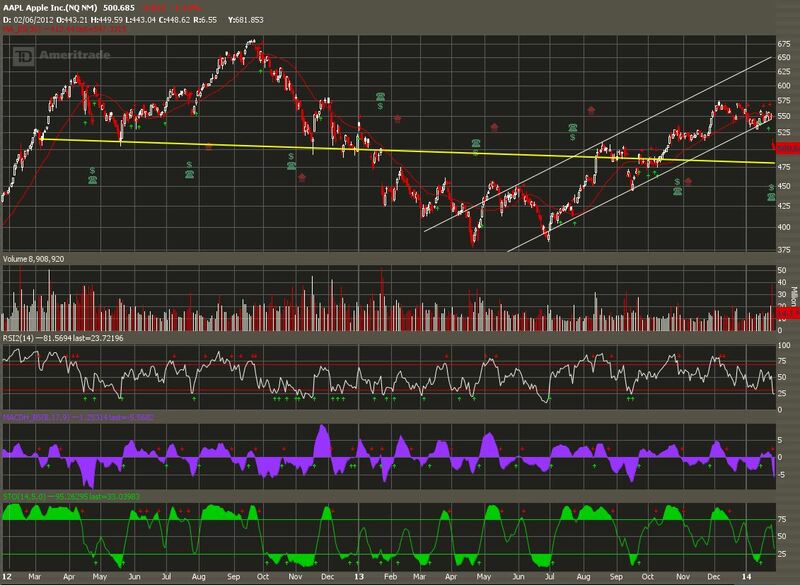 When the share price broke below the lower support line of that channel, AAPL shares dropped. Some would say that that ‘s an easy call to make now, but it didn’t prove itself out until the share price fell. But the point is that once the share price fell below that lower channel line, the share price did, in fact, fall. Classic Inverted Cup and Handle. And the share price looks like it still has further to fall to test the neckline of a two year long Head and Shoulders pattern, at about $477. So, what’s next ? The Stochastics, as represented by the green oscillating line on the bottom of the chart suggests that the share price has further to fall. The Relative Strength Indicator, represented by the white oscillating line, suggests that AAPL is in oversold territory now, but that’s not surprising, considering that it’s just started to sell off on huge volume. My point of view is that now, since the share price has fallen below the support line of the handle in the two year long Inverted Cup and Handle, that the price will test the two year long neckline on a Head and Shoulders pattern, represented by the long yellow line, that will complete the right shoulder when the $477 price area is touched. Break below that level of support, and you’ll have an opportunity to cover a short position at $450, and below that, eventually at $384. Pay attention to support and resistance along the way. Support at $477 could be tested, and bounced off of, with no test of $450 ever coming to pass. But I don’t think so. I think $477 will be tested, and eventually taken out, quickly followed by a drop to the $450 price range. I have no horse in this race. I am not currently long, or short, AAPL, but I’m a strong proponent of Technical Chart Analysis, and I was just wondering if APPLES’ fall in share price had been foretold by it’s chart pattern. It’s just my opinion, but I believe that the answer to that question is yes. On the afternoon of February 6th, Apple announced that they had been buying back 14 billion dollars worth of shares since the release of Q1 results. That’s billion, with the letter “B”. That’s a lot of shares priced around the $500.00 level. Since that announcement, AAPL’s shares have continued to rebound. Great , if you’re long AAPL, and not so great if you increased your short position after the conference call. On one hand, AAPL buying back shares would appear like a vote of confidence in their own company. And that’s the way many people are interpreting that action. On the other hand, if AAPL hadn’t stepped into to support it’s own companys’ shares at $500.00, and change, how far would the share price have fallen, if left up soley to the mechanics of a free market, without AAPLs’ corporate intervention ? The share price for AAPL today, as I’m writing this update, is at $541, and change. Not a bad 8% rebound within a weeks time, after having released the news about the buyback. If buying volume continues to support this rebound in share price, then the buyback will really have been a very astute move by AAPL management. But if volume drys up, and the price is no longer supported by volume, will AAPL spend another 14 billion dollars, in order to protect the share price from falling below $500.00, again. So far, so good , for AAPL, but volume on the last two days of this recent ascent, has been less than the average daily volume. If todays’ volume repeats that trend, it may signal the end of this recent rebound. As before, I have no position, long, or short, in AAPL. I’m just interested in the mechanics of how it’s trading, and why it’s trading the way it’s trading.